According to the detective, the two witnesses made “crucial statements” during the investigation into a N29 billion fraud case. 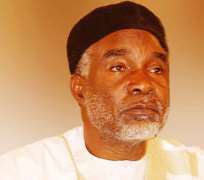 Nyako is being prosecuted by the Commission, alongside his son, Senator Abdul-Aziz Nyako, Abubakar Aliyu and Zulkifikk Abba, on a 37-count charge of criminal conspiracy, stealing, abuse of office and money laundering to the tune of N29 billion. Statements made by Maj. Iro at the Commission, were tendered and admitted in evidence by the court. According to the court, “Statements made by Maj. Iro on June 21, 2014; June 24, 2014; July 2, 2014; July 10, 2014; July 15, 2014; July 22, 2014; July 23, 2014; August 29, 2014 and October 22, 2014 admitted in evidence as LL40-1 to Ll40-9, respectively”. Also, statements made by Dalhatu Abdulmalik were tendered and admitted in evidence.